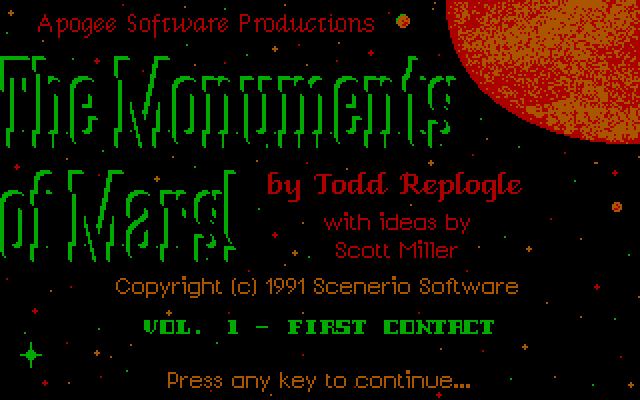 Monument of Mars was created by Todd Replogle for Scenario Software and released by Apogee sometime during 1990. 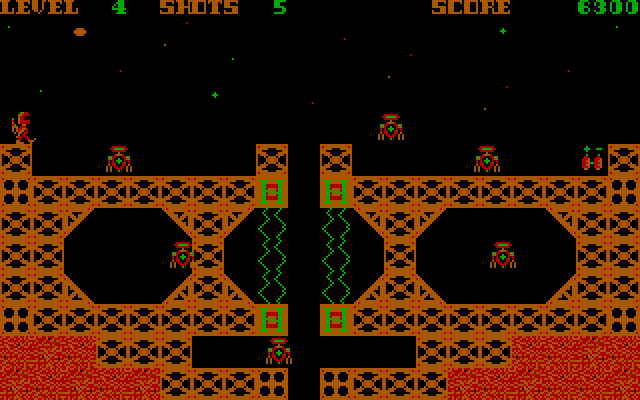 It is one of the earlier games that Apogee released and as such was made to run on the widest possible range of hardware possible. They re-used the FAST engine that was developed for Pharaoh’s Tomb and Artic Adventure, so there are some of the same issues with collision detection. Much like the other two games it uses CGA for graphics, and it animates nicely even on an older machine. The game does recommend that you don’t use an 8088 equipped machine, which I’m guessing is because of the crippled data bus. It was 8-bit compared to 16-bit on the 8086 and better machines, this made it much slower with graphics. I believe the other games running the FAST engine had similar issues with the 8088. The hand drawn sprites themselves are about as good as you can get with CGA graphics, and most of the sprites are animated quite well. The PC speaker is used for sound as most older machines had only that as a sound device, although they could all be fitted with an Adlib card at the very least. The sound isn’t bad, but the CPU speed will affect how fast the sound is played and also how long the game will pause whilst it is playing back. Slower machines will have longer pauses so may benefit from having the sound turned off to improve the rate of play. 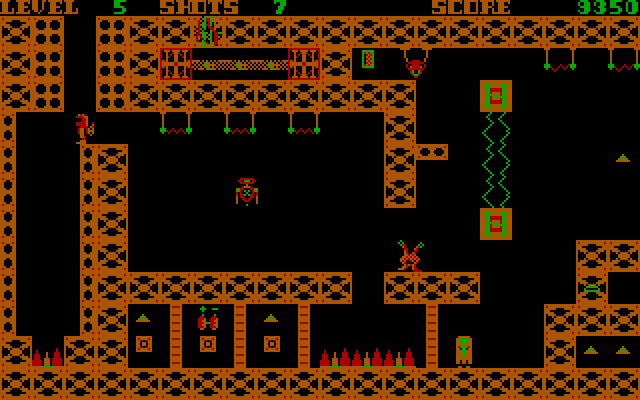 The puzzles and obstacles in the game are similar but not as brutally difficult as Pharaoh’s Tomb and Artic Adventure. The problems with collision detection are still there, but seem to cause you less problems in the process of completing a level. With a little practice I got through about 11 levels in a reasonable time on my first play, and I didn’t find it overly frustrating. They also start out at a much more reasonable difficulty level and get harder as you go. Most levels require you to get a key card to open the exit door. This may require you to jump over obstacles, and dodge or kill enemies. You have a limited number of shots for your gun so it is often best to dodge if you can, but ammunition can usually be found if you really need it. Some parts of the level have invisible switches that trigger when you walk over them, usually causing some blocks to appear. Usually this is to help you finish a level, so if something looks like you can’t get there, try looking for these invisible switches. As the difficulty gets harder it is fortunate that you have infinite lives as you will need a few attempts to finish a level. There is also a level restart button so you don’t have to restart if you get yourself trapped. In this way Monument of Mars is much less punishing of mistakes than Pharaoh’s Tomb. The technology used for the game was significantly out of date when it was released. Yet somehow it has a charm that makes it fun to play. The puzzles are challenging without being unfairly hard, and you aren’t punished for making a mistake. It runs on very old hardware that would have still been very common at the time it was made, so you didn’t need to upgrade too much in order to play. 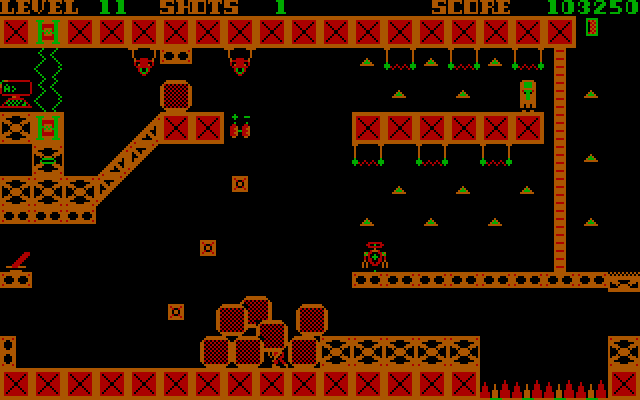 Apogee made Monument of Mars freeware in 2009, so there is little reason to not give it a go if you like puzzle platform games from the era. A very nice set of photos of some very old DEC gear. I’m a bit young to have ever used any of it, would have loved to have seen it in the flesh. Click the link to Retrocosms blog to see the photos. Had a great weekend at the DEC Legacy event in Windermere. Here’s a gallery of photographs that I took and some video. Just today on facebook, I was having a “conversation” (more of a rant really) about email and advertising. This was brought on by a friend of mine who posted a link to a blatant slander ploy by Microsoft in the form of scroogled. I won’t post a link to it as I don’t feel it’s appropriate to link to propaganda. Basically, the site goes into details about how they think Google is mistreating it’s users with the way they operate. To be clear, Google do read peoples emails in order to target advertising to them, they also use the web searches you do and any other information they can gather. This is not unusual, other companies such as Facebook, Apple, and Microsoft all do the same thing to some degree. The recent complaint is that people think Google have been spamming them, when really all they have done is put some discrete advertising at the top of their inbox. It’s not really spam, but if you’re a bit dim you might think it’s an email. So there is a grain of truth in the mound of salt that Microsoft put up on the web, but just how bad is it? Lets consider to start with that the services in question (Gmail, facebook, etc) are usually free of charge. So companies need to pay for running the service, and hopefully make some profit as well. They have already committed to making the service free so they have little option but to use advertising (much like free-to-air TV) to make money. Advertising is something we need to live with in order to have a lovely free service. Now Google read you email pretty much with the aim of picking more relevant ads to display. This should work in everyone’s favour, but people of course complain about invasion of privacy (perhaps rightly so). You get ads that may actually be relevant (you can always ignore them) and advertisers only pay for people seeing ads that might be interested in the service. The problem is e-mail never really has been private. The reason for this is basically the design of the basic protocols that make up the e-mail services we know today. The main ways of reading messages come in the form of imap, pop, and http (web-mail). Http fortunately can be encrypted, if you see https:// at the start of the URL people can’t intercept the messages between the server and you. Both imap and pop generally use plain text, which is easy to read and intercept. Again it is possible to encrypt these transport methods, but that is far less common for those types of connection. The transport of messages between servers is the really big flaw with e-mail services. SMTP is the protocol used, and whilst you can encrypt your SMTP connection to the server, the messages are often sent in plain-text from server to server enabling computers and clever people to intercept messages in a transparent way that is undetectable. Encryption of messages from server to server is starting to become common, but you can’t guarantee it. Yet. Another problem with SMTP is that anyone can send an email from pretty much any email address. This is how many phishing scams trick people. So is your e-mail really private. Well the answer is unfortunately no, anyone determined enough to find out what messages you are sending/receiving will get access to your messages. If they own the servers with your mail, they have full access with no effort. However privacy is gradually improving but not quite there yet. This is basically because the e-mail services as we know them were designed in the early days of the internet when such concerns were not thought of. If you have messages so private that you don’t want _anyone_ to read them you should consider using another service or encrypting the contents of the messages. All this being said, I’d expect far greater invasion of privacy on social networking sites as people give away far more information for free on those than we typically do via e-mail. Dark Ages was released by Apogee back in 1991, one of it’s distinguishing features is the use of older graphics technology, whilst having excellent sound support for the Adlib and Sound Blaster OPL music. The game is set in the Great Kingdom where a bad guy named Garth has taken over after the king died. You play as the prince and heir to the throne, and you set out to defeat Garth and regain your birth-right. The game was released as freeware in 2009, which is how I came across it when looking at the download section of the 3d Realms website when looking for another game. I hadn’t heard of the game before then, perhaps because it wasn’t widely distributed on magazine cover disks, or just not on the ones my older brother bought. I usually got most information about shareware games to play from the magazines back then. Mostly as we didn’t have a modem (which wouldn’t have worked well for us in the bush anyway). 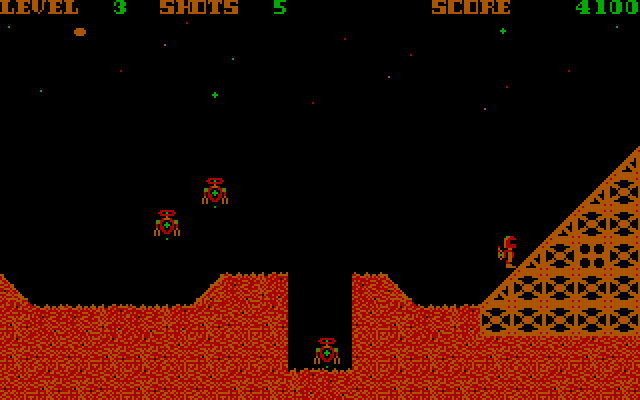 The games graphics are in EGA, which was very common at the time, especially amongst Apogee games. The graphics are reasonably well drawn and well animated, but look pretty average in comparison to other classic games that used EGA graphics such as Duke Nukem or Commander Keen. The players sprite in particular lacks detail. Sound is where this old game shines technology wise. 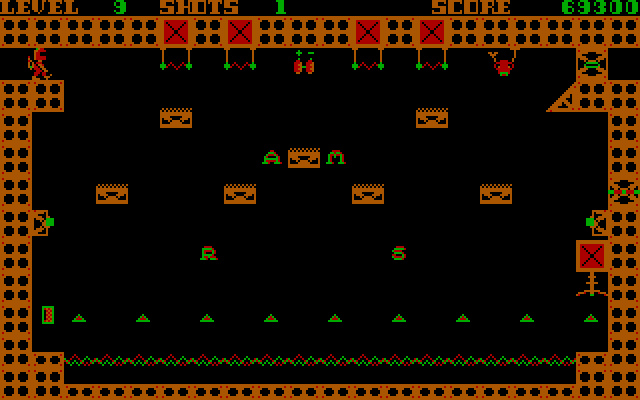 Whilst the sound effects use the PC speaker (a common technique even when a music card was present), the music is rendered using the OPL chip on either a Adlib card or Sound Blaster card. The music itself is quite fitting for the game, and sounds very good. It fits the atmosphere of the game and makes it feel more like an action game, even though it really isn’t. The Prince of pansies on a fetch quest. Game-play wise it is brutally difficult, but not for the reason that you might expect. For the most part enemies are easy to deal with, and there are usually only a few of them. The difficulty comes from the fact that health power-ups are very rare, making it difficult to heal once you are hurt. The layout of the enemies make it difficult to not get hurt, so it pays to be patient and be more careful in what you do. Some parts of the environment hurt you when you don’t expect them to, most notably the spider webs in corners hurt you, the prince must be a bit of a pansy. Despite the difficulty and less than great EGA graphics, Dark Ages is an engaging platformer. It fortunately doesn’t have a limit on the number of deaths so you can play levels as much as you need to in order to complete them. Most of the levels are quite short and have simple goals such as finding an item for a wise man. So once you have practiced the levels you can breeze through them quickly, fortunately there are plenty of levels to complete and 3 episodes to play.